Vinegar Yard, a brand-new eating, drinking, shopping and art space has opened on St Thomas Street, London Bridge, directly under the direct gaze of The Shard. Vinegar Yard is just two minutes’ walk from London Bridge Station and Bermondsey Street; and with art installations, container pop-up shops, bars, street food traders and a huge open air garden area with outdoor seating for hundreds of people, it’s set to become the definition of urban cool this summer in the capital. Open seven days a week from super early ‘till late, Vinegar Yard is the must-visit London spot for after-work drinkers, weekend fun-seekers, and those looking for the best in the capital’s street food. The rotating food line-up includes TV’s Million Pound Menu winners Baba G’s, who are serving Indian-inspired pachos and their signature ‘naanwhiches’; Argentinian-inspired steak and chimichurri from barbecue experts Up in My Grill and juicy burgers from Nanny Bill’s. Borough-based coffee experts, The Gentlemen Baristas, have opened a ‘well-mannered’ all-day coffee shop and dining space in the yard, serving from breakfast through to late daily, and a weekend brunch menu (full opening food line-up listed below). Vinegar Yard also offers an open-air bar serving cold draught beer and a rotating tap for local London craft breweries. And with indoor space for when the British weather doesn’t play nice, Vinegar Yard is the perfect place to relax and enjoy all-day eating and drinking throughout the summer - with the added bonus of ethical and sustainable shopping each day from its eclectic mix of makers and vintage traders. At the weekend guests can also pick up a one-of-a-kind item at Flea London, a pop-up curated vintage and makers market selling vintage clothing, homeware, books, ceramics, cameras and more. Packed with a collection of repurposed art and design including an unmissable train carriage installation, the site has been artistically curated and designed by founder Benj Scrimgeour; with installations created by celebrated British artist Joe Rush of Mutoid Waste fame. Joe is best known for his mechanical, mutant and monumental works made using scrap metal and discarded tools; notably his various sculptures at Glastonbury Festival, and collaborations with Vivienne Westwood and the Rolling Stones. Visitors to Vinegar Yard will be able to view Joe’s live onsite workshop, where his team of artists will work on ‘Stories from the Wasteland’ - an apocalyptic mechanical sculpture project that will be displayed around the site in the coming weeks. Turnips - the Borough Market fruit and veg legends will be serving freshly prepared risottos and juices. Living Earth (opening in May) - Hoxton’s open access studio Turning Earth bringing a selection of it’s finest ceramics. 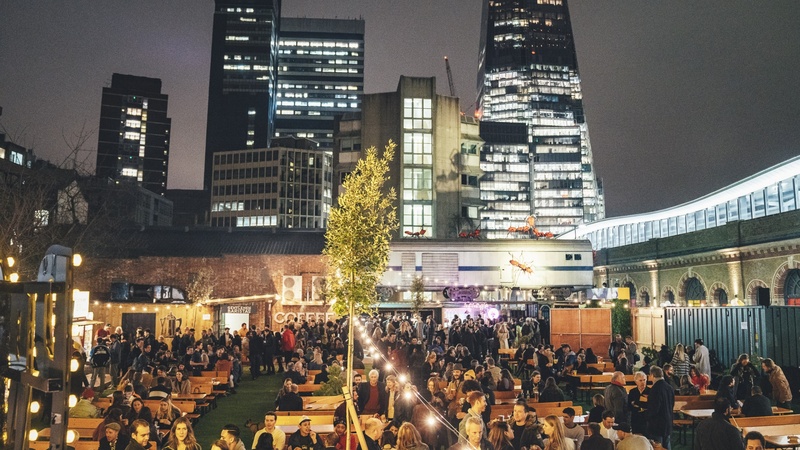 Vinegar Yard is the brainchild of Benj Scrimgeour, who’s vision to transform a disused car park into a vibrant cultural destination has resulted London’s biggest outside drinking and dining destination. Benj’s previous project, Flat Iron Square (which he has now sold), is a food and music hub that opened to critical acclaim in London’s Bankside in 2016 after taking over seven of London Bridge's railway arches. Prior to this, Benj ran The Arches, one of London’s biggest and most revered club nights on the 90’s house music scene.